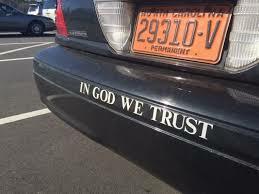 The bullying of local governments to put "In God We Trust" on public buildings has been going on in North Carolina for years now, organized by a Christian dominionist outfit called the U.S. Motto Action Committee. 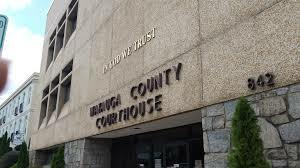 Watauga County Board of Commissioners Chair Jimmy Hodges lept on that bandwagon, and the Watauga County Courthouse now bears that declaration of religion in violation of the separation of church and state. "In God We Trust" was adopted by Congress as our official motto in 1956 at the height of the Red Scare. It replaced the original motto "E Pluribus Unum," out of many, one. The new motto was a symbol then of terror and Christian backlash in the face of communism and still is a symbol of that terror, though now they're mainly afraid of a Kenyan-born Muslim president who made the horrendous error of being born black. Barack Obama is just a little too e pluribus for many white people, along with the entire public education system, voting rights, and amendments 13-16 of the U.S. Constitution. North Carolina county governments have been falling like the proverbial dominoes to the current militance behind the push for "In God We Trust." To refuse to go along with this crowd is to risk being called "godless" or worse, a Methodist. In Davidson County, N.C., the authorities ordered the four words on the sides of every patrol car. There have been a few -- very few -- bumps in this road to Christian theocracy in North Carolina. The Jackson County chair of the board of commissioners told the religion peddlars to not bother showing up there. But the sharpest slap in the face came from the Cherokee Tribal Council during the first week of February. Cherokees Say, "How Dare You?" The Christian shill for the U.S. Motto Action Committee got a reception at the Cherokee Tribal Council that might have been his Little Big Horn. It only got worse after that. Charitably, the proselytizing committeeman was allowed to withdraw his resolution. He quickly left the Tribal Council chambers, his sanctified tail between his sanctified legs. You can read the full blow-by-blow in the Smoky Mountain News. It appears in your mad dash to write up an article, that you did exactly what this man did, you didn't do your research! First of all, it was not the Cherokee Nation that sent this man away, it was the Eastern Band of the Cherokee Nation, a VERY different Band of Cherokee. The Cherokee Nation is located in Oklahoma, but had you done your research, you would have known this. Also, you would know, had you done your research, that there are a multitude of churches on the boundary that the EBCI lives on. They didn't reject this resolution because they didn't agree with him, they rejected it because they didn't want an outsider, like you, telling them what they should and should not do! And, in closing, you are no better than the individual who tried to get "In God we trust" placed on the council house. You are just another person that tries to use any incident to push your own agenda! I hope in the future, you will take the time to "Do your research!" I apologize for the error. As for the opinion, I think I'll stand by that. The movement to get "In God We Trust" onto public buildings is not about faith. It's about power and politics. The group pushing that is interested in forcing their views on everyone else, and from what I saw, the Tribal Council was reacting negatively to that force. And well they should.